On the southwest shores of Vietnam’s famed “Pearl Island,” Phu Quoc, Best Western Premier Sonasea Phu Quoc takes the beach resort and accentuates it with the tropical magic of a wondrous seaside tale. Each of the resort’s venue and facilities adds to the beauty of this oceanic journey. The Lagoon - which is the longest lagoon pool in Vietnam - flows through the resort and guests can savour delectable international and local cuisine inside top F&B venues. The CView Sky Bar, Essence Restaurant, and Oasis Pool Bar are sure to offer superb food and drinks to satisfy every taste and palate. The seaweed-themed Thala Spa is a serene wellness haven and young guests will be entertained at Nemo’s Kids Club. This Southeast Asian jewel lures guests to “live in the sunshine, swim in the sea", and “drink the wild air” in the words of American poet Ralph Waldo Emerson. Being just ten minutes from the airport and thus a short flight from both Hanoi and Ho Chi Minh City with multiple direct flights internationally, make Best Western Premier Sonasea Phu Quoc beach resort a convenient escape into a tropical wonderland, aworld that transforms the word fantasy into fantasea. In just a matter of hours, one can be transported from the heavy air of Vietnam’s densely populated cities to an island paradise that is sure to leave a lasting impression on each of its guests. After a brief ride from the airport, a car service will drop guests in front of the resort where they will be greeted with warm smiles and an inescapable calm that underscores Phu Quoc’s tropical mystique and seductive charm. A carefully arranged group of hanging pearl-shaped ceiling lamps decorate the naturalwooden theme of the front lobby. In the centre of the lobby’s floor, lies a glossy circle in the shape of a pearl which emits an unobtrusive gleaming light at all hours of the day. The pearl is the central theme of this tropical beach resort in Vietnam where you will find a collection of sculptures, pictures, and decorations emphasising how the Best Western Premier Sonasea Phu Quoc masterfully embodies the island’s jewel-like status. The Lagoon, which is the longest lagoon pool in Vietnam, is one of the central attractive features of the resort. This mesmerizing 300-metre body of water is lined by shady palm trees, sun loungers, and a calm current that flows all the way from the main building down to the beachside Oasis Pool Bar and beach area. Over 130 metres of pristine, white sand is lapped by warm clear seas inside a private beach that offers the perfect combination of relaxation and adventure. More than 8,000 cubic metres of water fill this spectacular pool, which offering the young and (the young at heart) a most awesome opportunity to splash away. The beach offers plenty of room for guests to kick back and relax while soaking up the sun. More adventurous guests can enjoy a variety of beach activities including surfing, paddle boarding, ocean kayaking, snorkelling, beach barbeques, beachside cocktail specials and of course, stunning sunsets. For those who prefer to maintain their fitness routine indoors, the Fitness Center features state-of-the-art equipment. The name Sonasea, or “Sonata of the Sea” offers a promise of a memorable, seaside and sunset infused vacation. 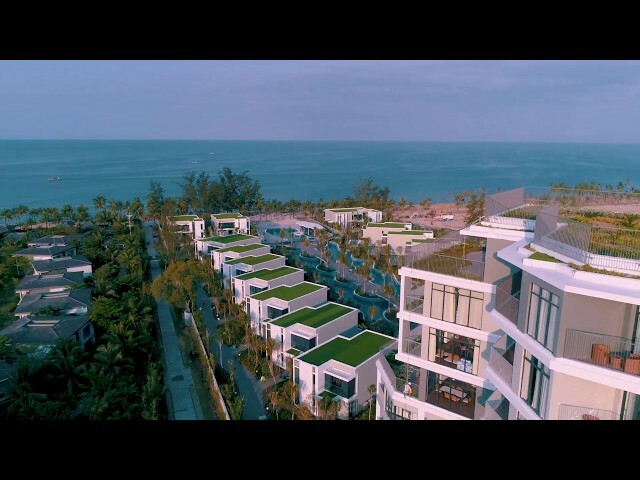 Overlooking the vast turquoise waters of the Gulf of Thailand, Best Western Premier Sonasea Phu Quoc received Dotproperty’s prize for “Best Landscape Design”, underscoring its ambitious architecture and fabulous design. Superior accommodation at Best Western Premier Sonasea Phu Quoc means that entering each guestroom is like opening an oyster and uncovering a carefully crafted pearl. Despite the grandeur of the resort’s scale, each guestroom features impeccable attention to detail. For the best in family friendly suites and villas in Phu Quoc, you can’t go wrong with BWP Sonasea. As a standard of the Best Western Premier brand, the resort’s exquisite collection of 566 spacious guestrooms, suites and villas all include a kitchenette and minibar, high-quality rain showers, 24-hour room service, plus Yukata Japanese-style light colourful robes and slippers suitable for the warm climate of the island. Wooden-themed furnishing that includes a sofa bed and dining table, plus a central comfort lighting system and international electricity sockets, are just a few of the conveniences offered in each room. The resort allows guests to bring up to two kids under the age of 16 who can sleep comfortably in the sofa beds thoughtfully provided in each guestroom. In addition, all guest rooms include private furnished balconies with garden, mountainside or sea views as well as plush bedding, 43-inch screen flat TVs, and plastic-free luxury amenities that feature locally sourced, natural ingredients such as coffee and lemongrass infused soaps. Extended In-Room Dining and Late Night menus provide guests with the optimal choice for in-house delight and relaxation. Guestroom categories range from Deluxe rooms to Presidential Villas which range from 35 to 280 square metres. The resort lauds an impressive 566 guestrooms and 16 private pool villas. Close to 100 Suites have bathtubs that are the perfect way to cool down and unwind. All Deluxe guest rooms have Queen or King size beds along with fresh linens washed in-house. Each upgrade is designed to accommodate the diverse needs of different guests. For example, the Executive Deluxe room comes with a convenient writing desk while the Deluxe Suite comes with 2 bedrooms and separate living and dining rooms that accommodate 4 people. Grande Suites have 3 bedrooms with a furnished sea view balcony, two shower rooms, and a bathtub while a Penthouse offers the best views along with expanded kitchenette options, a 6-person dining room, and an espresso machine. Deluxe villas come with 3 bedrooms that each have their own living areas, perfect for the small family that wants a beach-side splurge. If you are looking to rent a villa in Phu Quoc, Best Western Premier Sonasea Phu Quoc’s luxury villas offer extra space for groups or families and come with additional luxuries such as en-suite bathtubs, private terrace with swimming pools along with a sea view or beach front, separate kitchens with island sitting as well as a living room and dining room that can accommodate 8 persons. Best Western Premier Sonasea Phu Quoc’s remarkable design invokes several natural elements characteristic of Southeast Asian tropical islands. Inspired by Phu Quoc’s crystal clear, blue sea, white sand, and stretches of green coconut and casuarina trees, designers sought to create a mirror-like effect in the architectural layout. The resort’s lagoon and swimming pools resemble the sea, its roads play as the beach’s white sand, and gardens invoke a canopy of trees. Finally, the scale of the main building mimics a colossal mountain enveloped by colourful water fountains and glittery light arrangements. The overall structure of the building is an X shape created to provide the maximum number of rooms with panoramic views of the ocean. A sky view of the X shape makes the hotel look like a beautiful flower floating on top of a natural green background that seeks to create a kind of harmony between the building and nature. The resort’s modern Indochine-style interior design displays a natural theme that combines modern simplicity with traditional, decorative motifs found in carefully placed locations throughout the resort. From sofa fabrics to the panelling on walls, columns, ceilings, and floors, the tropical elegance blends modern comforts of upscale hospitality with Vietnamese designs that harmonize with local beauty and scenery. When you need to replenish and satisfy your appetite or thirst, BWP Sonasea has you covered with some of the best bars and restaurants in Phu Quoc. In addition to the Oasis Pool Bar, the hotel offers the outstanding Essence Restaurant with its atmospheric design and excellent international and local cuisine. Enjoy a fantastic breakfast buffet, Vietnamese-influenced set lunch, or delightful dinner looking out at the main swimming pool. For a slice of spectacular, head up to the gorgeous CView Sky Bar on the resort’s rooftop - the perfect location for adults to enjoy some alone time with a refreshing cocktail and stunning Phu Quoc sunset. Without a doubt, Best Western Premier Sonasea Phu Quoc exceeds expectations by offering its guests a spectacular vision of greenery and winding waterways that reflect the natural beauty of Vietnam’s crown jewel of tourism, Phu Quoc. Whether one is searching for serenity in proximity to a vast ocean, or an eye-catching experience that transports you to paradise, the exceptional service, decor, and variety will capture the hearts of guests and leave lasting memories. Come find love, equanimity, synergy, and calm. Whether you are a new couple going on your first vacation, or a hard-working family spending quality time on the island, Best Western Premier Sonasea Phu Quoc invites you to create beautiful memories. The resort features elegant venues for a well-rounded upscape travel experience. More than a beach resort, Best Western Premier Sonasea Phu Quoc is an invitation to return to the most noble of causes, to relish in the journey of the soul. Only a few steps away from a soft white sand beach, each visit is call to listen to the sounds of the waves and the songs of the sea.